The Edwardian era, also referred to as the beautiful era was characterized by its extravagance in terms of fashion. Jewelry was an integral part of the life of the people. The Edwardian rings were not of geometric forms and they did not resemble the modern rings in any way. They looked traditional antique jewelry pieces and had exquisite designs carved out on them. Romance was often associated with these antique Edwardian rings. These rings were symbolic of love, often presented in the form of engagement rings or wedding rings. These rings had prominent, elaborate patterns and designs along the crown area and also in the region of the band. The styles included pierced patterns and some other integrated patterns. There were a number of small stones along with a big stone placed in the centre. During the Edwardian era, pave setting rings were in fashion. Some Edwardian rings had a contour pattern and arched shaped structure. Some other patterns included on the rings were small intricate designs of flowers, birds, vines, hearts and bows. These made the appeal of the rings very romantic. Amongst the simple ones, the prong design was often included. The other design which was in demand included bezel settings. The rings had an antique style to them and simple round shaped diamonds were often included in them. 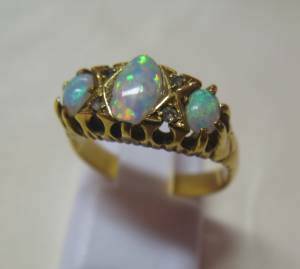 Gem stones were not frequently used in the antique Edwardian rings. But sometimes the rings showcased gemstones like sapphire, ruby and aquamarine. The metals which were extensively used for making Edwardian rings were white gold, silver and platinum. Yellow gold was not used that much in making Edwardian rings. Filigree rings mean any jewelry which is delicate and intricate, made out of gold, platinum, or silver. Filigree rings were introduced for the first time in the third century by ancient jewelry craftsmen. The Greeks were fascinated with the concept. They worked on it to develop it, to bring out more designs and more innovations on the jewelry. The jewelry has a charm and carries a romanticism of its own. King Edward rules England from 1901 to 1910. During this time, the upper class of England was dressed at their best and adorned themselves in luxurious pieces of jewelry. The jewelry of the Edwardian age had its own characteristics. It was inspired by fresh ideas. The Edwardian jewelry was not the heavy dark colored jewelry of the previous era. It was more light, airy and whimsical. 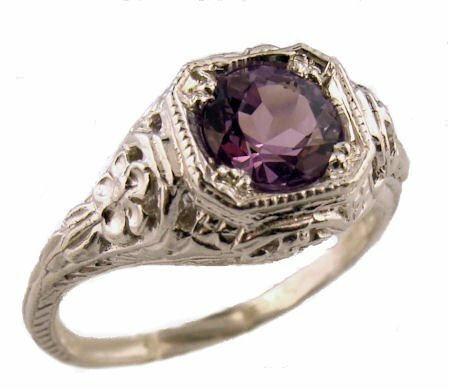 Therefore, you can understand that the filigree rings were a favorite of the Edwardians. But there were many bold filigree rings worn too during the Edwardian era. These had angular patterns. Platinum was a favorite metal of the Edwardians. The Edwardians were obsessed with the color white. A special Edwardian filigree ring consisted of 0.34 carat diamond set in a platinum ring. It had leafy designs all over. Then a beautiful ring is the blue aquamarine wheat point ring. This ring was a special engagement ring. It was set in white gold. The Edwardian filigree rings symbolize sophistication. The Edwardian jewelry has Indian influences to some extent. In his visit to India, he fell in love with the jewelry that was created in India, especially the jewelry that the royals in India wore. Some Edwardian filigree rings survive till date and are found in the antique collection of some people.